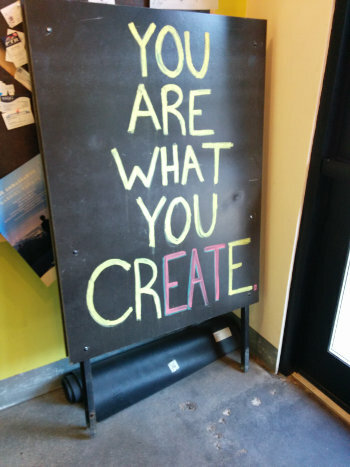 Are We What We Create? Over a year ago, I took the photo you see at the left. It was a chalkboard sign just inside the entrance of a local restaurant. If the restaurant employee who scrawled those words knew how many times since then I've been rolling them through my brain, they'd probably wonder what's wrong with me. When I first read the words, they were inspirational and even a bit motivational to me. They seemed to be telling me "It doesn't matter what anyone says about you, or what they think about you, what matters is what you create. 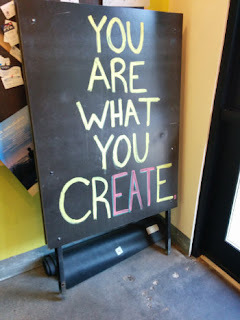 So, go create!" That inspiration renewed my blogging and writing energy. Later, the words took on a new meaning for me. They seemed to be saying, "Hey, you haven't finished a novel yet. You haven't finished a short story. You haven't created anything outside your job. You, sir, are nothing." When my word counts began to slump, this version of the meaning metaphorically punched me in the gut. Now, I'm 49 and staring 50 in the face. In just a few months, the forties will be a memory. It's making me look at my life and ask, very seriously, what have I created? A good short story? No. A decent novel? Nope. A catchy tune? Negative. A nice garden in the back yard? Uh... no. Sure, I've created some things. I've written a software deployment script at work that's been used over a thousand times. I created a way to test that script automatically to ensure that all of its functions work. I built a web-based survey system, various system administration tools, mounds of documentation, more PowerPoint presentations than I ever wanted to give, and lots of emails. Some of it may last longer on this Earth than I do, but probably not by very long. So what is my legacy? I've read where a lot of people say that what we should strive to do in our lives isn't to accumulate, or even to create, but to do something that leaves the world a better place than we found it. I'm not sure I've really done that, either. No eradication of poverty, no curing of disease, and no new public parks. I'm starting to circle back around to that original meaning... I need to go create!